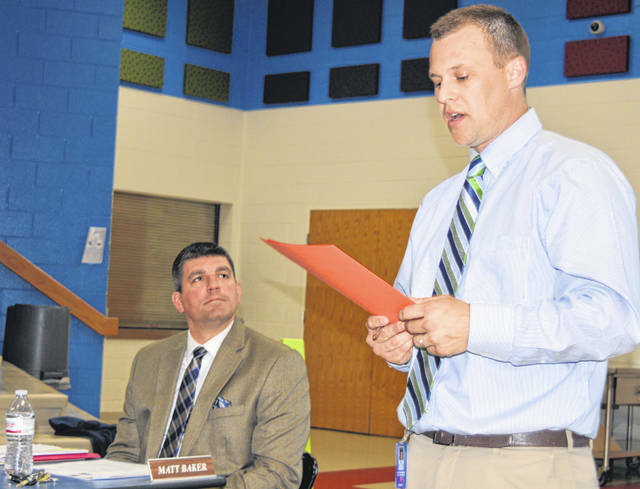 Clinton-Massie High School Principal Aaron Seewer, right foreground, delivers a report at this week’s school board meeting. On the left is Superintendent Matt Baker. 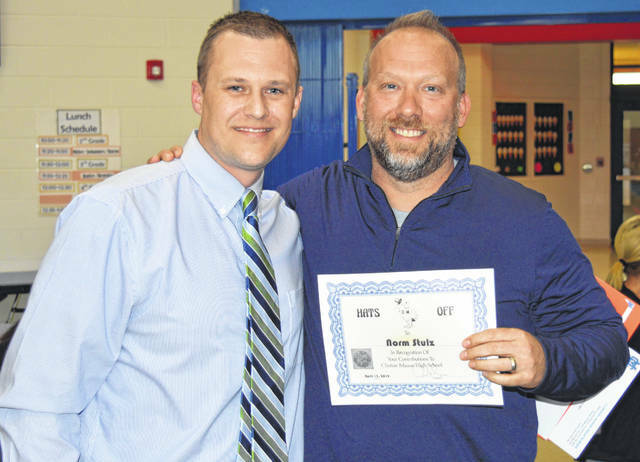 Norm Stulz, right, Clinton-Massie High School anatomy and zoology teacher, is recognized by High School Principal Aaron Seewer, left. Clinton-Massie Food Service Director Tracy Mathews wants to increase the number of district students who get a school breakfast. ADAMS TOWNSHIP — Clinton-Massie officials recently learned the district’s medical insurance rates will go up 26 percent next calendar year. The hike involves almost a $389,000 annual increase in medical insurance costs to the school district and its employees. Currently, Clinton-Massie employees pay 15 percent toward their medical insurance benefits. 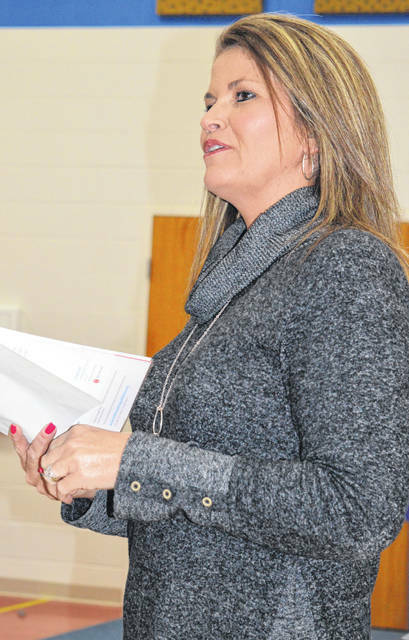 The good news, if you will, is that the Educational Purchasing Council consortium feels that after this jump, it should be able to get back to 5 to 10 percent increases each year, Clinton-Massie Local Schools Treasurer Carrie Bir reported Monday night to the board of education. “Their explanation for such a large increase is due to the increased costs of medications and procedures. For instance, in 2016, their largest claim statewide was $630,000 and in 2018 it was $3.9 million,” stated Bir. The CM treasurer gave a second example. In 2016, the Educational Purchasing Council statewide had 68 claims more than $150,000 and in 2018 that number rose to 132 claims. Bir described the Educational Purchasing Council as basically a consortium for smaller schools to get better prices. In conjunction with a monthly financial report, Bir told the News Journal that if a proposed 0.5 percent (½ of 1 percent) earnings tax passes in the May primary election, the projection is that Clinton-Massie will meet the cash balance benchmark through 2023, the extent of the current financial forecast. “That will keep us out of fiscal watch/emergency/etc.,” added the treasurer. In a presentation to the board, Clinton-Massie Food Service Director Tracy Mathews said five years ago the department had 22 employees and currently has 15 including herself. She wants to increase the number of students in the district who get a school breakfast. Presently it’s less than 13 percent district-wide. Her efforts to increase breakfast participation will start with the middle and high schools. Superintendent Matt Baker said the school district has been chosen for a pilot program of Grant Us Hope, better known as the Hope Squad, which is a suicide prevention program. The program is in 55 school districts in Ohio. Baker said Massie officials are aiming for a January 2020 rollout for students. Because it is a pilot program, the price for Clinton-Massie is $1,000 rather than $4,000. The superintendent said, with months remaining for kindergarten registration, there currently are 103 children registered, including 10 open-enrollment students. Clinton-Massie is offering the option of full-day kindergarten for the 2019-2020 school year, in addition to its current half-day experience. Clinton-Massie High School Principal Aaron Seewer reported the Chamber Singers have qualified for state competition for a fourth consecutive year. He also reported the goal of a Student Career Pathway Survey is to gather students’ career interests to better design courses and student supports. The principal shined a students spotlight on Connor Harrison and Sam Binau who have advanced to a national competition in Anaheim, California after qualifying at the regional and state levels in the Business Professionals of America Club. At the regional level where about 45 students competed, Harrison placed first and Binau finished second. At the state level, there were about 40 students in the Fundamentals of Accounting category — Binau placed second and Harrison fifth. They take the national test in early May. Seewer aimed his staff spotlight on Norm Stulz, the high school anatomy and zoology teacher, calling him “one of our teaching all-stars.” From co-curricular and extra-curricular standpoints, Stulz has been a Project Trust advisor for years, an athletic site coordinator, a class advisor, has brought laughter to campus through the “Massie Tonight Show,” and is a strong student advocate, said Seewer.